Gawande in the operating room. Gawande speaks with patient Ericka Webb (right) at a post-surgical follow-up. Medical student Devon Quasha ’02, J.D. 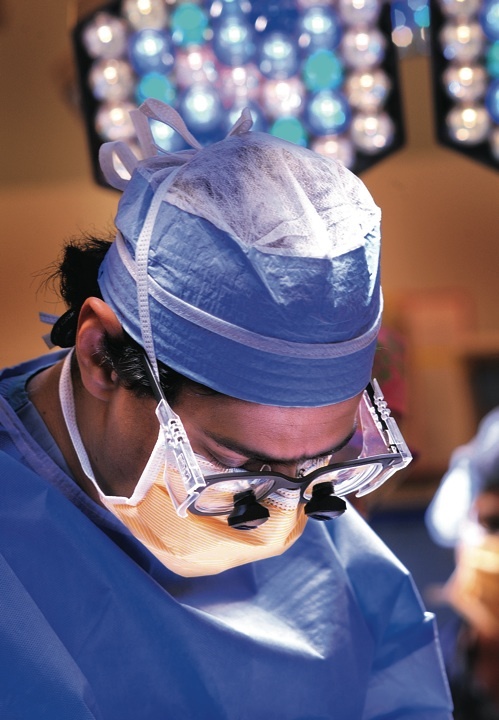 ’06, is at left..
Gawande’s hands are at right in this photograph from the operating room. A checklist for surgical safety saves lives. Read the text of Atul Gawande's speech at the Harvard School of Public Health’s 2009 diploma ceremony on (the challenges facing public health). Hear Elizabeth Gudrais talk about reporting this article. One Wednesday last April, Atul Gawande was in his office at Brigham and Women’s Hospital, trying to make some progress on a New Yorker article about disparities in healthcare spending. He kept getting paged when other physicians thought their patients might need surgery. By late afternoon, there had been a few false alarms: he visited patients and ruled against operating. Responding to a page about an elderly man who had had heart surgery the previous week and was now in severe abdominal pain, Gawande got on the phone with the surgical resident and pulled up an MRI on his computer screen. He navigated through digital slices of the patient’s abdomen, squinting at the screen, then agreed to meet the resident at the patient’s room. 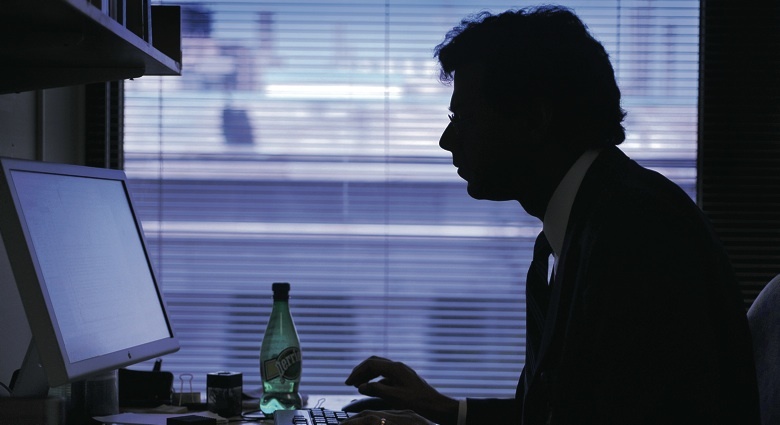 As he got up from his desk, his movements took on a sense of purpose. “I think this one’s real,” he said. Gawande had seen that part of the man’s colon was ischemic —dead and gangrenous—and had ceased to move waste out of the body. He wasn’t sure about the cause, but suspected a blood clot. One thing was clear: without immediate surgery, the colon would rupture. After examining the patient, Gawande conferred with the resident in the corridor outside the man’s room. He went through a familiar and well-practiced set of actions that he seemed to do without thinking: slipping his ring finger into his mouth to moisten it, working his wedding band off, unbuckling his watchband, threading it through the ring, and refastening it, all the while carrying on a conversation about stopping the patient’s anti-clotting medication and getting a vascular surgeon to assist. One moment, this patient’s children had thought he was on the mend from cardiac surgery. The next, they were having to process the fact that he faced near-certain death if he didn’t undergo another procedure with its own dangers. Suddenly, a life was in Gawande’s hands. The New Yorker would have to wait. The medical writing for which Gawande is best known represents only a small fraction of his professional output. He is a surgeon, and a busy one at that, performing 250-plus operations a year. He is a professor at Harvard Medical School (HMS) and the Harvard School of Public Health (HSPH). He heads a World Health Organization initiative on making surgery safer. And he is a husband and a father of three. A few days after the emergency surgery on the man with the ischemic colon (who survived and recovered), Gawande was back in the OR, removing the enlarged and possibly cancerous thyroid lobe of a 42-year-old schoolteacher. This is the type of surgery he most commonly performs, cutting open patients’ throats to remove thyroid and parathyroid growths. And after thousands of hours of practice, he works with an air of assurance. Operating on the throat is not simple: it is densely packed with nerves, blood vessels, and a surprising amount of fat. It bears little resemblance to an anatomy chart, where body parts are neatly subdivided and set off from one another in contrasting colors. But Gawande knows what he is looking at when he peers into the patient’s throat through the thick magnifying lenses of his OR glasses. He can gaze into a messy, bloody incision and see nebulous boundaries between various tissue types. Huddled over the blue-draped schoolteacher, Gawande and a surgical resident performed a delicate dance, their movements synchronized. One snipped to remove suspicious tissue; the other, following just behind, sewed up. As they went, they cauterized small blood vessels and took care to avoid larger ones and the vocal-cord nerve. With this patient, Gawande decided to transplant one parathyroid gland (essential for maintaining proper blood calcium levels) to ensure that it would have adequate blood supply after the woman recovered from the operation. He removed the amorphous parathyroid tissue himself and smeared it on a small plastic tray. Then he instructed the resident, for whom this innovative procedure was new, to gather up the parathyroid “like peanut butter” (indeed, it has a pastelike consistency and the surgical tool looks like a butter knife) and tuck it back into the patient’s throat in a different spot. 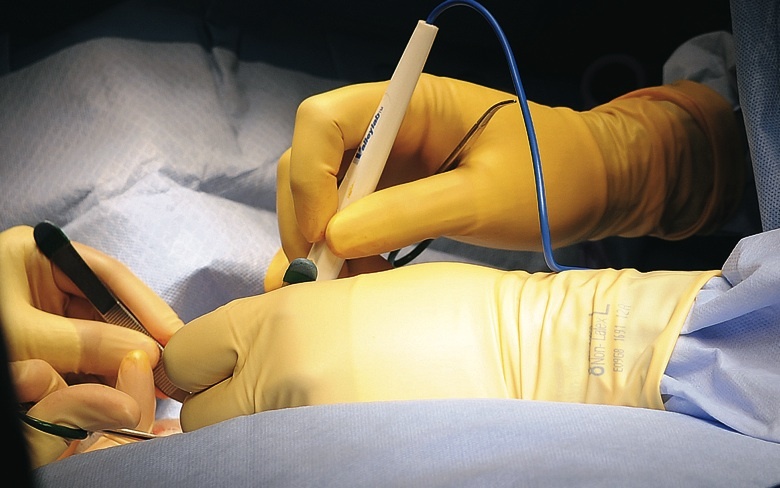 Surgery demands decisiveness: waffling has no place in the operating room. Surgeons face judgment calls, large or small, every few seconds, and the pace does not allow for second opinions. He is far from the stereotype of the surgeon who thinks he is God, and this emerges in his writing. When he tackles thorny political issues, his arguments do not have polarizing overtones, and he does not use words to browbeat. When he takes a position, it often comes with an admission that the other side has merit. If a patient with gallstones wore a shirt she could untuck for the abdominal exam, this worked fine. But then I’d encounter a patient in tights and a dress, and the next thing I knew, I had her dress bunched up around her neck, her tights around her knees, and both of us wondering what the hell was going on. helps more than it hurts. But we don’t know; the study has never been done. And that itself is evidence of how much we’ve underestimated the importance and difficulty of human interactions in medicine. If Gawande is an unlikely surgeon, envisioning a career in medicine, more generally, was easy. He grew up in Athens, Ohio, the son of a urologist father and a pediatrician mother, and he has often said that following them into the field seemed so inevitable that he tried every way he could think of to avoid it. Careers he considered along the way included philosophy and politics; they did not include writing. Those earliest pieces did take work. Gawande’s wife, Kathleen Hobson, a former comparative literature major who has worked in book publishing and in magazines, gave the inaugural Slate column a first edit before submission. She says it demanded a “slash and burn” approach: “It was horrible.” This is related in a tone of wry affection—and astonishment at his progress since then. His first New Yorker piece, in 1998, took nine months from submission to publication, and went through 22 rewrites; today, they typically take just a couple. Phrased that way, Gawande’s success as a writer makes perfect sense: he writes like a surgeon, including just the essential details, cutting away the fat to find what is relevant. There is one more similarity between medicine and journalism: they share a resemblance to detective work. An article begins with a question, as does a diagnosis. Through a strangely circuitous route, Gawande has arrived at a life in which diverse pursuits dovetail seamlessly. Most people with professional interests as disparate as his—medicine, politics, philosophy—must choose one and relegate the others to hobbies or a Plan B. Gawande has managed to pull them together, but more through fumbling in the dark, he says, than by design. After his 1987 graduation from Stanford with a degree in biology and political science, he went off to Oxford to study philosophy. “I hoped to become transformed, to become a thinker, perhaps a professor of philosophy,” he told the Yale commencement audience. But it took all my capacity just to answer the questions philosophers asked, let alone offer anything like original answers. I had no natural ability in this and, though I came back a bit better educated and better traveled, I was not fundamentally changed. To hear him tell it, he gave up on philosophy. But its influence survives in his writing, both in whom he quotes (Montaigne, Descartes, Alasdair MacIntyre) and in how he frames issues. In 2003, after medical school, residency, internship, and a master’s degree in health policy from HSPH—all told, 16 years after completing his undergraduate degree—Gawande officially began his career as a professional, as opposed to a student, surgeon. He wanted to be in a supportive environment for his “unusual mix” of surgery, public health, teaching, and writing. He had spent years calibrating this delicate balance at the Brigham, and he decided to stay. The schoolteacher’s thyroidectomy was the second of five operations for Gawande that day. The third was a 41-year-old woman with a parathyroid growth that was causing calcium to leach from her bones into her blood. Gawande would remove the growth, then send a blood sample to the lab to see if her parathyroid hormone levels had returned to normal. These near-instant results meant he could know if the surgery had succeeded before bringing the patient up from anesthesia. During the 45-minute wait, he stepped out of the operating room, leaving the patient with the surgical resident, anesthesiologists, and nurses. From a tiny office just adjacent to the OR, he could still see in through a window. He scrolled through some e-mails on the computer, then picked up the phone and dialed. “Hi, it’s Atul….Are you a basketball fan?” Headed to Palm Springs the following weekend for a medical conference, he was trying to give away tickets to an NBA playoff game in Boston. He was taking two of his children along and was excited about the trip, but “it’s killing me” to miss the game, he admitted. Gawande was on the phone with a journalist when the surgical nurse interrupted with the test results. Satisfied with the numbers she recited, he instructed her to give the surgical resident the OK to apply the final dressing to the patient’s wound. Turning back to the phone, he dialed into the hospital’s dictation system to give a report for the patient’s medical record, talking so fast that the boundaries blurred between words. Then it was off to tell that patient’s family how the procedure had gone, and then to the pre-operative holding area to talk to his next patient. This kind of effortless toggling between tasks helps explain how Gawande can keep so many balls in the air. Certain other habits also contribute. He arrives precisely on time—not late, but not early either. He leaves swiftly when meetings end, as others linger to chat. There is nary an idle moment in his day. He saves his writing for the hours between 7 and 11 a.m. and 4 and 7 p.m. to capitalize on the body’s circadian rhythms. And it helps that he isn’t bothered by a lack of downtime. Gawande’s no-nonsense focus can sometimes make him come off as brusque or formidable. Many nurses and doctors inject color into the OR by wearing headgear decorated with stripes, polka dots, or a sports-team logo; Gawande opts for standard-issue plain blue. He eschews comfort footwear, such as clogs or sneakers, in favor of flat-bottomed leather loafers. But he humanizes himself in other ways. OR teams that work with him are treated to a soundtrack of alternative rock from his iPod (a recent playlist included Tom Petty, the Clash, Modest Mouse, Feist, Dido, and M.I.A.). With students and other mentees, he is supportive and patient. He has an easy smile, and he considers a genuine interest in others important, greeting people by name and recalling personal details, regardless of their status in the hospital hierarchy. He seems to guard his time so closely not for selfish reasons, but so that he can be generous with it when he wishes. During a meeting with his research team, a junior colleague was having trouble working out the design of a pilot project on reducing childbirth-related mortality. Gawande offered to make himself available to discuss the details: “late night, evenings, weekends, whatever we need to do.” He does a surprising number of media interviews—several radio appearances after the March publication of his article on solitary confinement, and an entire hour on an NPR show after his article on disparities in U.S. healthcare spending appeared in June. And he doesn’t leave every room the moment his obligations end. After giving a talk to HMS students, he stuck around to answer questions for the long line of students who gathered, staying until the technical staff started packing up and turning out the lights. 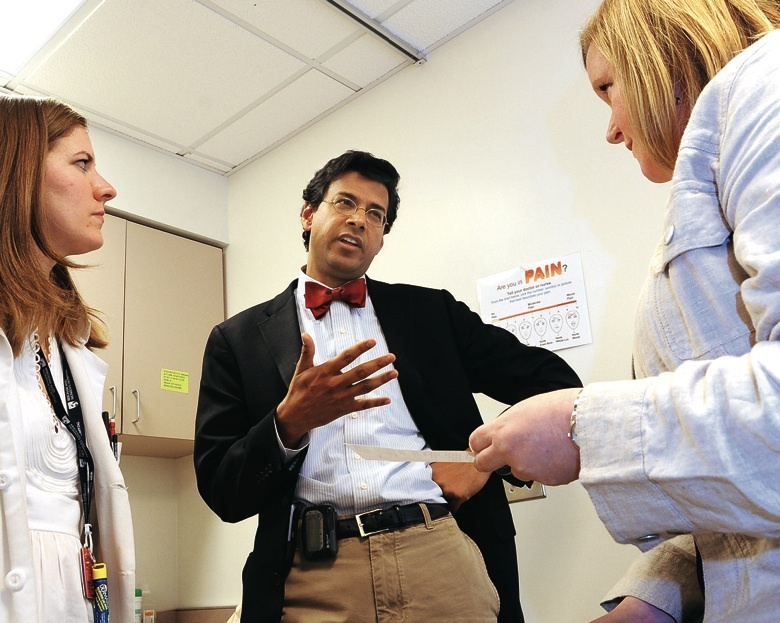 One Monday afternoon at 4 p.m., Gawande was finishing his ninth office visit of the day. Coming out of the exam room, he found a sandwich, potato chips, and bottled water waiting at the computer station where he would enter notes into the patient’s medical record. This wasn’t a mid-afternoon snack; his assistant had secured the provisions because meetings had taken up his whole morning and he’d skipped lunch. He took a few bites between bursts of typing, but then it was on to appointment number 10. By 5:30, when he saw his twelfth and final patient, the sandwich was still not fully eaten, and he had barely touched the water, or for that matter had anything to drink all afternoon. This wasn’t a particularly busy day; it was a typical Monday. Gawande does this day after day, week after week, and somehow he hasn’t burned out. It is partly the legacy of residency, which teaches young doctors a catch-as-catch-can approach to sleep and food. But one also gets an impression of a man so engaged in, and stimulated by, his work that physical needs are an afterthought. He is in a constant state of flow. His week proceeds according to a carefully calibrated schedule. Mondays are for pre-operative or post-operative consultations with patients. Tuesdays are for meetings, of his research team and otherwise (and frequently, speaking engagements). He spends Thursdays in the OR; Fridays he works on his writing. Wednesdays are for the overflow, and some writing time if he’s lucky. In spite of all he does, he leaves the hospital most nights around 7 p.m. At the end of a 12-hour day, he is home in Newton in time to eat dinner with Hobson (who is now a full-time mom) and their son Walker, 14, and daughters Hattie, 12, and Hunter, 10. Across his portfolio of pursuits, Gawande displays a willingness to be influenced by people he respects, and to recognize good ideas when he finds them. He says he would not have gotten a public-health degree had Zinner not suggested it. The policy concept perhaps most closely associated with his name, the surgical checklist, was not his to start with, as he readily admits (see “A Checklist for Life”). At least as important is Gawande’s knack for choosing exactly the right case to write about—a reflection of the exhaustive reporting that goes into each piece, and the number of cases he researches and rejects. For an article on itching, he found a woman who had experienced itching so intense that she scratched through her own skull. In one on blushing, he tells the story of a young woman who was on track to achieve her long-held dream of becoming a television news anchor, but found herself crippled by chronic blushing (and then flew to Sweden to have a controversial new procedure that disconnected the blushing reflex by severing some nerves). …by putting your writing out to an audience, even a small one, you connect yourself to something larger than yourself….An audience is a community. The published word is a declaration of membership in that community, and also of concern to contribute something meaningful to it. His writing serves to amplify the impact of his surgery and his policy work. After his January New Yorker article on learning from other countries’ experiences in designing American healthcare reform, he was invited to testify before Congress. The New York Times reported that his June article on healthcare spending disparities had so intrigued President Obama that he discussed it with aides and cited it in a meeting with senators. And the checklist figured into the plot of a March episode of the popular television drama ER.